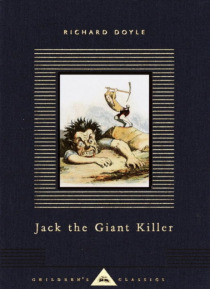 The story of Jack, the intrepid boy whose courage and ingenuity defeated a host of many-headed giants, has been told to children for hundreds of years. In 1842, when he was just 18, Richard Doyle, whose natural talent for draftsmanship was matched by imaginative invention and a passion for legend and the grotesque, created a picture-book version of Jack the Giant Killer, with hand-written text and… a watercolor within a pictorial border decorating every page. It has remained one of the most beloved versions of this timeless tale.In this new Everyman's edition, Doyle's vivid, wonderfully engaging illustrations have been enlarged and the text has been given greater legibility. It is a book that will satisfy both the child's delight in scariness, wonder, and magic, and the collector's pleasure in classic Victorian illustration.